Late summer and early fall finds sunflowers at their full glory. Many roadsides and meadows are sprinkled with color because of the annual appearance of wild sunflowers. Fields of cultivated sunflowers are ablaze with gold at this time of the year as the large flowers bask in the sun. Garden sunflowers also are nice now because of their size and affinity for warm temperatures. The name 'sunflower' normally is applied to any member of the plant genus Helianthus. The latter word is derived from the Greek words helios meaning 'sun' and anthos which means 'flower'. Taxonomists consider the genus somewhat bewildering because of the number and diversity of species it contains. The genus Helianthus, in turn, is a member of the plant family Asteraceae. Members of this family bear a compound inflorescence known as a "head". The latter consists of a row(s) of petal-like ray florets that surround an inner tuft of disk florets. In the case of Helianthus, heads range in size from several inches to over one foot in diameter. In most cases, the colorful ray florets are yellow, gold or orange. There are over 60 species of Helianthus. Two of them H. annuus (annual sunflower) and H. tuberosa (Jerusalem artichoke)bear the distinction of being the only two food crops domesticated centuries ago in what is now the United States. Interestingly, annual sunflower travelled to Russia where it was improved and commercialized. It later returned to the U.S. where it now is an important oil and seed crop. Archeological findings suggest Native Americans began raising sunflowers for food and medicine as early as 2300 B.C. This predates the cultivation of important native crops such as corn, beans and squash, which is an indication of their importance. Sunflower seeds usually were roasted and ground into a fine meal for baking or thickening agent for stews. Alternatively, they were made into a butter-like substance which was used to form "seed balls". The latter were used a food source when traveling. In addition, early Native Americans roasted sunflower hulls which were then made into a coffee-like beverage. 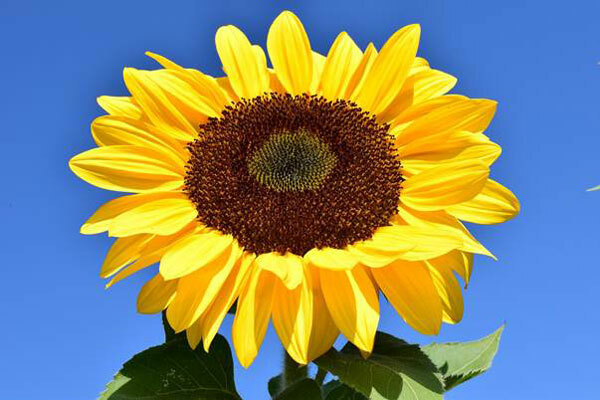 Oil, extracted from sunflower seeds by boiling, was used as cooking oil, hair tonic and a treatment for a range of ailments from snake bite to sunstroke. As previously mentioned, sunflower still plays an important role in the U.S. economy as an oil and seed crop. However, it is the ornamental value of this plant that is of greater interest to gardeners. Recent improvements to sunflower have made it increasing popular in beds and border throughout the Midwest. Ornamental sunflowers can be divided into one of two types: annual or perennial. Many of our annual sunflowers today are members of the species H. annuus; others are hybrids. Those considered more ornate usually are shorter in stature (three to five feet) and produce somewhat smaller, vividly-colored flowers in greater abundance than those grown for seed. 'Ring of Fire', 'Soraya', and 'Suntastic Yellow with Black Center' are three fairly recent introductions to the gardening world. All have received the coveted All American Selections award and typify today's annual sunflower. They are short in stature, free-blooming and have brightly colored flowers four to five inches in diameter suffused with yellow, gold and bronze. Other popular cultivars include 'Teddy Bear' which bears fully double bright yellow flowers on plants that reach a mature height of only two feet, and 'Ballard'. The latter is perhaps the smallest sunflower available and has the added virtue of being pollen-free. Perennial forms of sunflower also are available. Many are hybrids and go by the scientific name H. x multiflorus. They tend to be robust growers and typically bear an abundance of golden-yellow flowers two to three inches in diameter mid-summer through fall. Double and semi-double cultivars (e.g. 'Flore Pleno', 'Loddon Gold' and 'Meteor' and 'Sunshine Daydream') are very colorful and becoming increasingly popular. Commonly grown non-hybrid (species) perennial sunflowers include H. angustifolius (swamp sunflower), H. divaricatus (woodland sunflower) H. maximiliani (Maximilian sunflower), H. occidentalis (western sunflower) and H.salicifolius (willowleaf sunflower). Species sunflowers tend to be a bit taller than hybrid types and are good choices for the back of the perennial border. Named cultivars of some of the species sunflowers are available. Heliopsis helianthoides (sunflower heliopsis) is a perennial very similar perennial in appearance to the perennial sunflowers and hence is often confused with them. There are several outstanding cultivars of this species, 'Summer Sun' being the most noteworthy. Be they annuals or perennials, sunflowers are relatively easy to grow and do well under Missouri's environmental conditions. As their name implies, sunflowers love sun and need a minimum of six hours per day to thrive. Additionally, they prefer a well-drained, slightly acidic soil. They tolerate heat and dry conditions quite well but do appreciate adequate amounts of water, if it can be supplied. Avoid the temptation to fertilize sunflowers heavily (especially with nitrogen), since this leads to excessive vegetative growth and poor flowering. Sunflowers are not without disease and insect pests but the latter rarely warrant control. Annual sunflower is propagated from seed which usually is directly sown in the garden after the soil warms in the spring. For a head start, consider planting seeds indoor in small pots about two weeks before the weather warms enough to set them out. Perennial types are propagated by division in the spring or fall. Sunflowers, especially the newer, shorter cultivars are good choices for the border garden. The shorter cultivars can be novel additions to containers. Additionally, sunflowers can be used in the cut flower garden. Since the advent of the newer, brightly-colored cultivars commercial production of cut sunflowers has become a cottage industry for a number of gardeners. Finally, sunflowers make ideal plants for children's gardening projects. Their large seeds are easy to handle and their rapid rate of growth and ability to handle adverse conditions make success almost guaranteed.